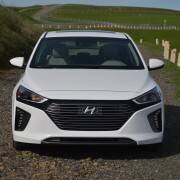 Hyundai’s Ioniq debuted in 2017 as a direct competitor to the Toyota Prius. 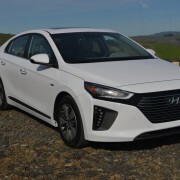 So direct, in fact, that Hyundai was recently offering a $1,000 coupon to current registered Prius owners or lessees who bought a 2017 Ioniq. 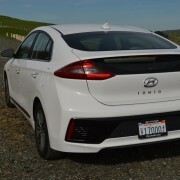 For 2018, the Ioniq ups the ante of Hyundai’s challenge to Toyota by offering a plug-in version for the first time. 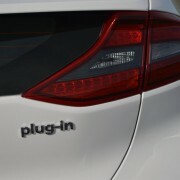 In several important respects, the Ioniq plug-in outdoes the Prius. Firstly, it looks much better. 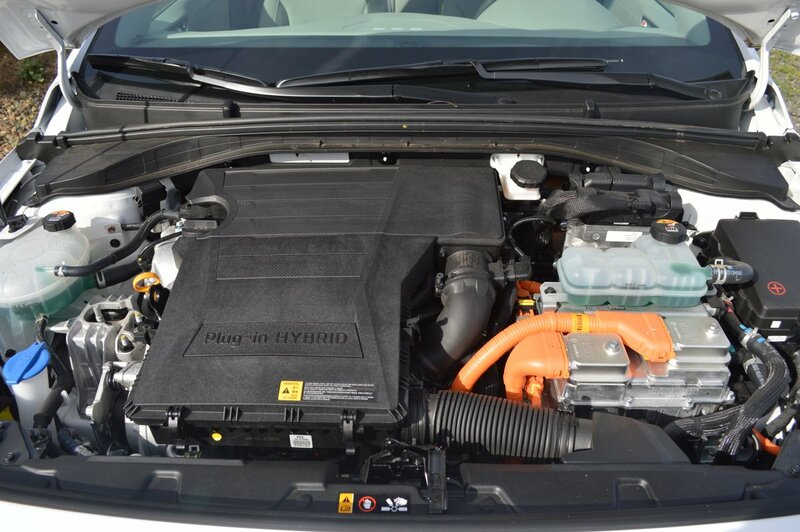 Instead of the intergalactic over-styling of the Toyota hybrid, the Ioniq looks positively fetching in its simplicity. 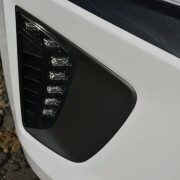 But don’t let the Hyundai’s sleek appearance deceive you into thinking it’s lacking aerodynamic efficiency. 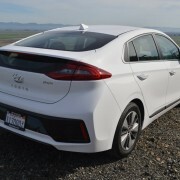 To the contrary, the Ioniq posts a remarkably wind cheating 0.24 coefficient of drag, which helps it attain its stellar EPA/DOT rating of 119MPGe. 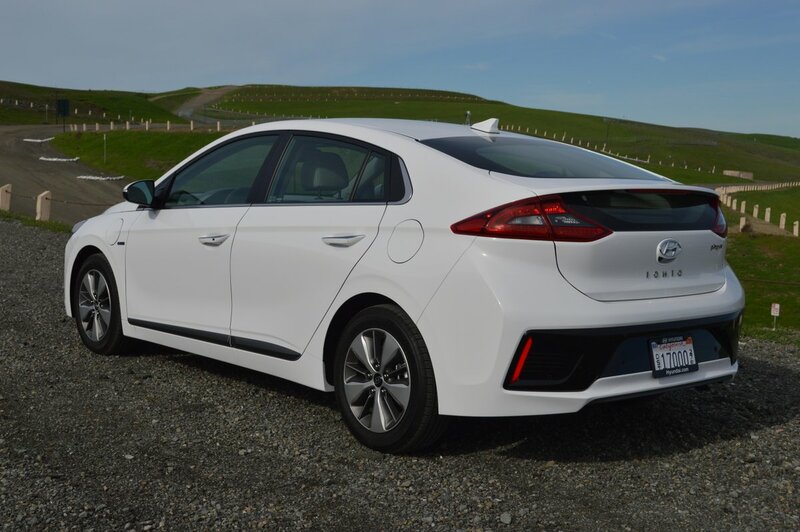 Inside, the interior of the Ioniq is far more restfully detailed than the pin ball latrine look of the Prius. 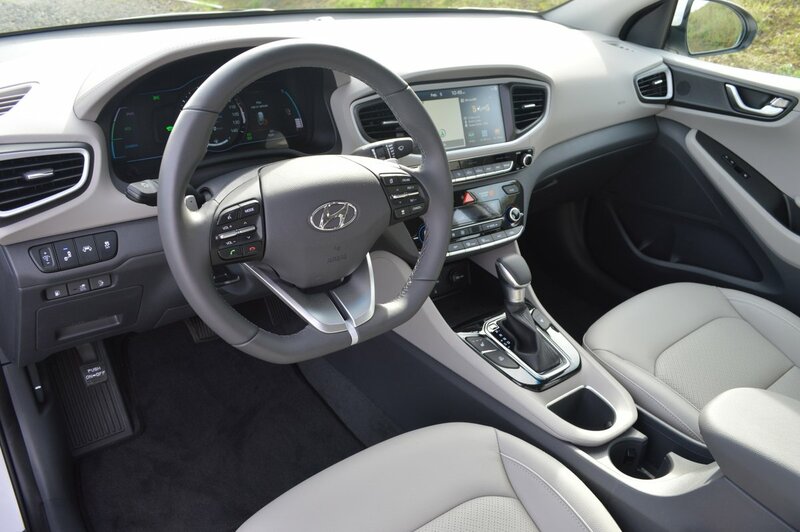 Hyundai has found a way to go green inside the cabin as well as under the hood, because the Ioniq utilizes sugar cane and volcanic stone to form much of the interior. 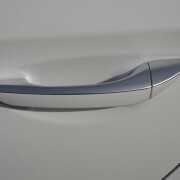 According to Hyundai, “sugar cane accounts for 25 percent of the raw materials used in the interior’s soft-touch door trim panels.” Additionally, recycled plastic forms the headliner, carpeting and door trim, so this Hyundai represents a science project for reclamation. 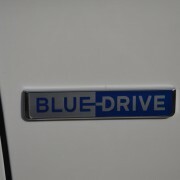 But how does it drive? 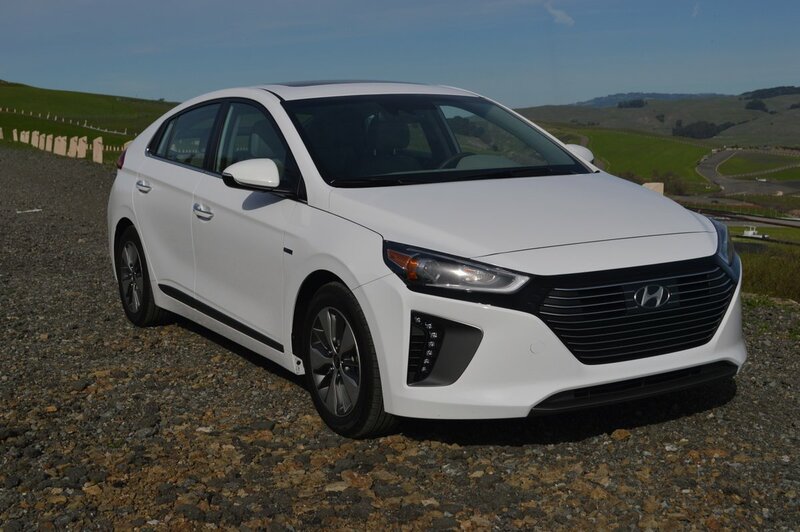 To its credit, the Ioniq behaves more like a gasoline powered sedan than a pure electric car. 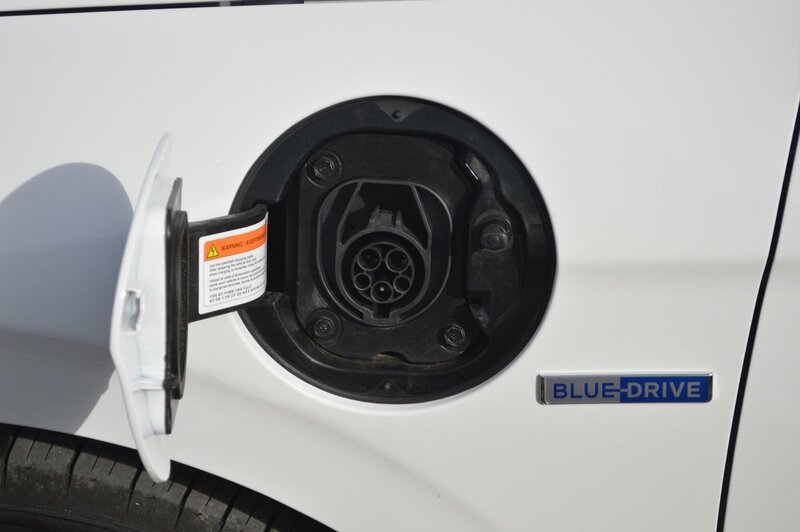 This is good news for those of you who are put off by the idiosyncrasies of cars like the Prius that require you to reconfigure your driving style to accommodate their peculiarities of design. The Ioniq makes no such demands on your attention, nor does it prioritize fuel saving with obnoxious visual displays of its green virtue. 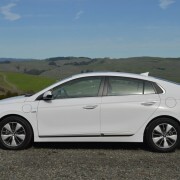 In other words, you can drive this Hyundai like a regular car without the need to have your eco-credentials verified every time you climb into the driver’s seat. 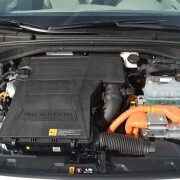 Together, the 1.6 liter gas engine and the 44.5kW electric motor produce a rather piddling 139hp. 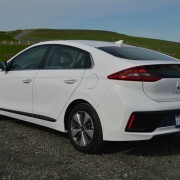 But since Hyundai had the foresight to supply this Hybrid with a real 6-speed dual clutch automatic transmission, that mere 139hp feels unusually frisky in a car that weighs only 3,070 pounds. 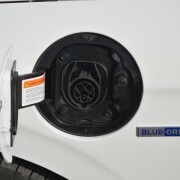 To manage the “EcoShift” transmission, you can either leave it in Drive and let it do all the work for you, or you can slot it into manual mode and bump the floor-mounted stick forward or backward for upshifts and downshifts. 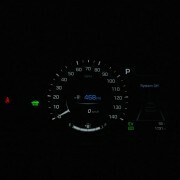 Better yet, rely on the thoughtfully provided steering wheel mounted paddles to accomplish the same goal. With its power to weight ratio of 22lb/hp bordering on lazy, the Ioniq needs all the help you can give it with manual gear selection. 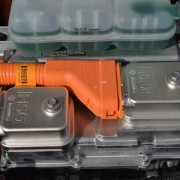 That’s an essential tool that missing from the CVT-transmission Prius. 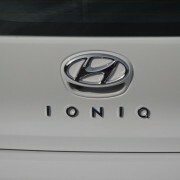 If you opt for electric-only propulsion, the Ioniq will take you about 20 miles before needing a recharge. 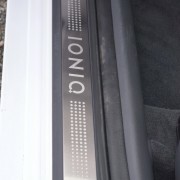 Open the rear hatchback and you will find a 120V charge cable neatly packaged in an Ioniq satchel. You will also discover a surprisingly spacious storage area which amounts to 19.5 cubic feet with the 60/40 split folding rear seats and center rear armrest stowed. 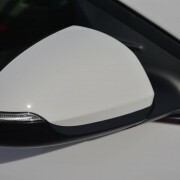 That large rear hatch also provides excellent aft visibility thanks to upper and lower heated glass panels divided by a stiffening bar placed mid-window. 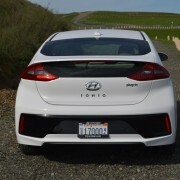 Our test Ioniq included the “Ultimate Package” which Hyundai had not priced at the time of this test. 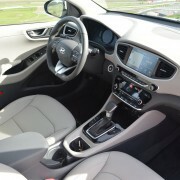 Some of the benefits of this option group include power sliding sunroof, navigation with 8 inch touchscreen, premium audio with 8 speakers, dual wireless device charging, plus three safety features – automatic emergency braking, smart cruise control and lane keep assist. 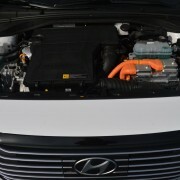 The rubber Hyundai has chosen for this hybrid is compatible with its mission as an ultra high mileage achiever, one which returns 52MPG in gas-only mode. 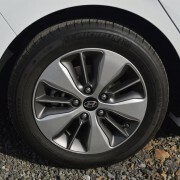 To insure that kind of performance, the tires need to be quite hard and the 205/55R16 Michelin Energy Saver A/S rubber you’ll find on the Ioniq comply with that mission statement. 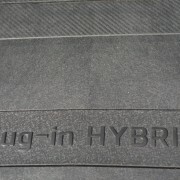 Unfortunately, their treadwear rating of TW 480 is incompatible with generating much lateral adhesion on the skid pad. 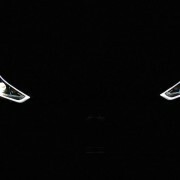 So you’ll want to re-equip your Hyundai with something stickier, or learn to back off the throttle when negotiating tight turns at speed.